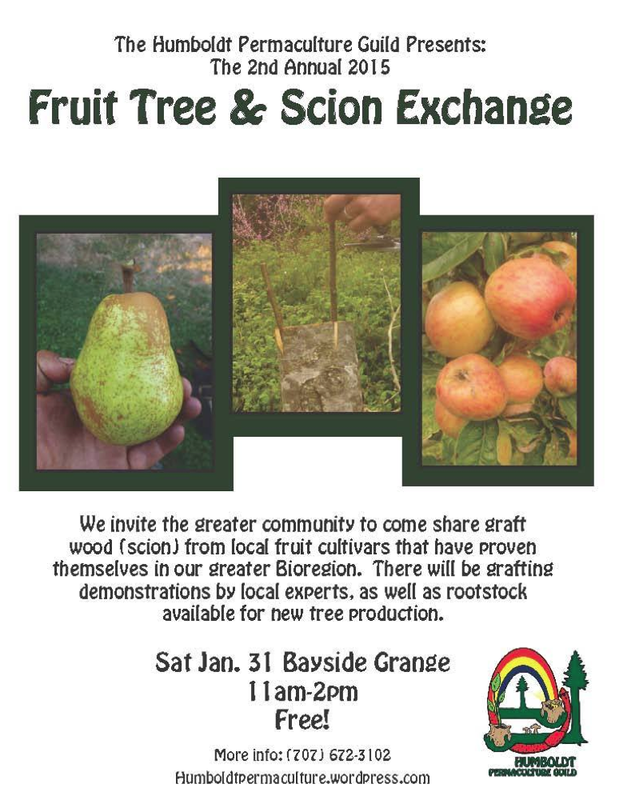 The Humboldt Permaculture Guild has confirmed plans for Humboldt County’s second annual Fruit Tree and Scion Exchange. The event will be held on Sat. 31st at the Bayside Grange in Arcata from 11am to 2pm. This event follows the same spirit of our annual Seed and Plant Exchange but focuses on the exchange of perennial fruit tree propagation material. Because this material is collected in winter while trees are dormant, we are hosting this separate event. Both experienced fruit growers as well as the general public are invited to share quality scion wood and talk about growing fruit in Humboldt County. With the diversity of microclimates in our area, the Scion Exchange is meant to educate the community on which varieties do best in our unique region. For those who are already growing plenty of fruit, we invite you to share scion wood from your best producers or exotic cultivars. For those who have established trees that don’t produce good fruit, we invite you to come collect scion wood from our event that you can later graft to your existing tree. And for those who are still planning/planting phase, we invite you to come chose your cultivar, which we can show you to graft onto new rootstock, which you can take home with you. We will have grafting demonstrations by local experts as well as a few varieties of rootstock available. Since the fresh fruit is mostly gone, we invite you to bring fruit of any preparation (sauce, butter, juice, dried, etc.) to share the flavors of our cultivars. Photos are handy as well. Hope you can make it. For more info call Marlon Gil at (707) 672-3102. Hi ~ Was hoping to attend your fruit tree scion exchange this year and can’t find info on when it will be. Please let me know if it has been scheduled. Thank you. The Scion Exchange is scheduled for Feb 13 at the Bayside Grange. We are in the planning stag as we speak and it looking to even bigger and better than last year. Flyers and e-mail announcements should go out at the beginning of Feb. I’ll try and get some info up on the website soon.